In the usual telling the father welcomes back the prodigal son by slaying the fatted calf … not the son himself. This, uh, alternate version comes from the diary of Nuremberg executioner Franz Schmidt. His father let him lie in prison here, and desired and insisted that justice should be done, in spite of the fact that he had recovered his money. * i.e., he was sentenced to hanging as a common thief, but was given the quicker and more honorable execution of beheading as a mercy. January 2nd. George Hörnlein of Bruck, Jobst Knau of Bamberg, a potter, both of them murderers and robbers. Two years ago Hörnlein and a companion attacked a carrier on the Remareuth, stabbed him four times so that he died, and took 32 florins. Six weeks ago he and Knau were consorting with a whore. She bore a male child in the house, where Knau baptised it, then cut off its hand while alive. Then a companion, called Schwarz, tossed the child in the air, so that it fell upon the table, and said: “Hark how the devil whines!” then cut its throat and buried it in the little garden belonging to the house. A week later the above-mentioned Hörnlein and Knau, when the whore of the aforesaid Schwarz bore a child, wrung its neck; then Hörnlein, cutting off its right hand, buried it in the yard of the house. Six weeks ago Hörnlein and Knau with a companion, a certain Weisskopf, attacked a man between Herzog and Frauen Aurach. Knau shot him dead, took 13 florins, dragged the body into the wood and covered it with brushwood. To conclude it would require another half sheet to write down all the people they attacked … The two murderers were led out on a tumbril. Both their arms were twice nipped with red-hot tongs, and their right arms and legs broken; lastly they were executed on the wheel. 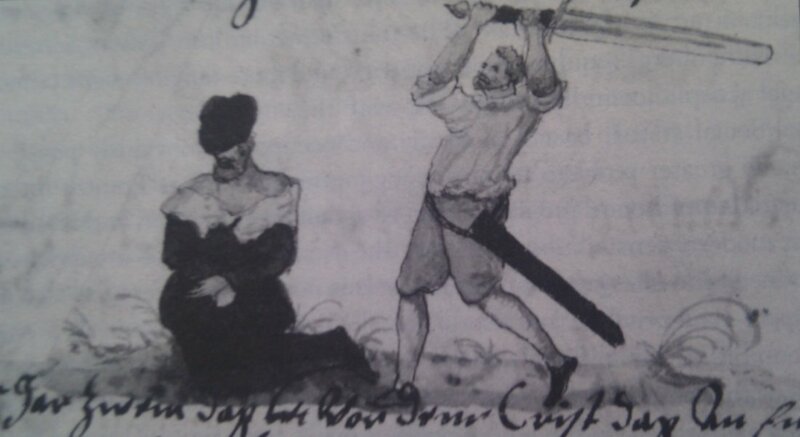 On this date in 1589, Hans Volckla of Onoltzbach, alias Hemmerlein, was beheaded by Nuremberg. 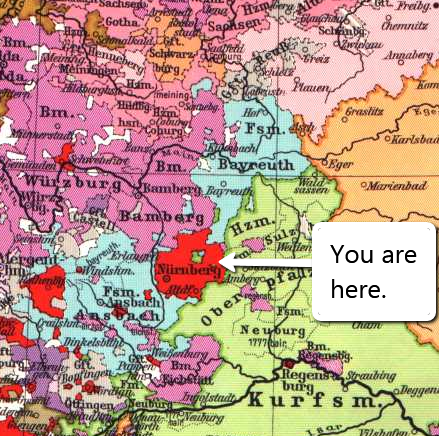 In early modern Germany’s crazy quiltwork of rivalrous fiefdoms and principalities nominally confederated in the Holy Roman Empire, the free imperial city of Nuremberg and its surrounding lands stood irritatingly athwart the non-contiguous Margravate of George Frederick — who ruled Ansback to Nuremberg’s southwest, and also Brandenburg-Bayreuth to Nuremberg’s northeast. Local rivalries in this period could easily boil over into micro-wars, and this had happened before between Nuremberg and the Margravate. In 1502, George Frederick’s grandfather* had raided the disputed village of Affalterbach causing several hundred casualties; in 1552, that long-running dispute saw the village burned to the ground. Moreover, he led a little gang that shot three men fatally in 1587. Nuremberg declared him an outlaw. But this date our concern is Hemmerlein, and it was a serious concern of Nuremberg as well: they meant to cut off the head of a man in the train of the very tetchy next lord over. Only weeks earlier, on May 28th, Nuremberg had likewise executed a man named Hans Ramsperger as a betrayer and a spy for the Margrave, but at least that man was a Nuremberger. In the event, there was no attack and the execution went off without incident in the early morning. * He openly encouraged allied nobles to shake down Nuremberg merchants, according to Hillay Zmora. ** Nuremberg erected its Zeughaus armory in 1588. 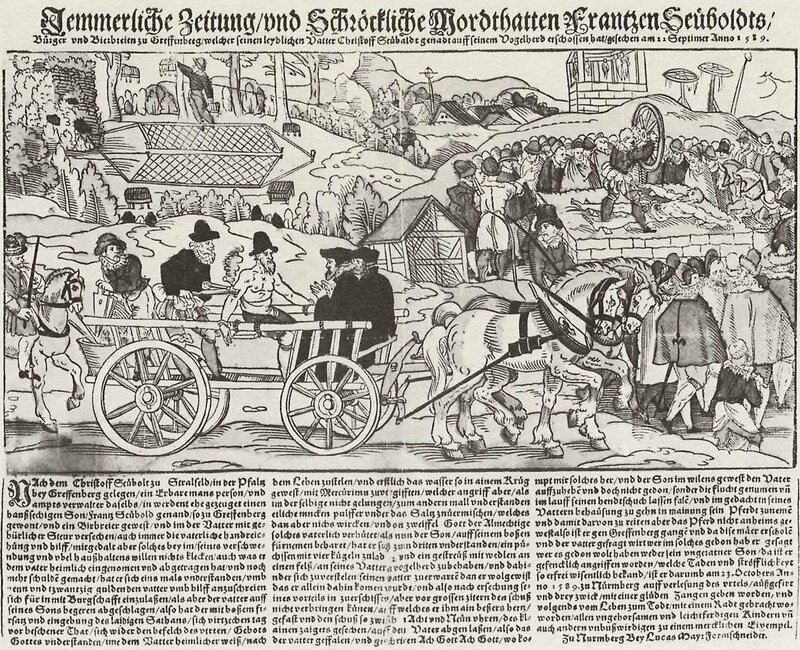 On this date in 1605, Nuremberg privy councillor Niklaus von Gulchen (or Gilgen) was beheaded for his scandalous corruption. The wheeler-dealer’s graft had problematically extended to playing false with and backstabbing any number of elite patrons, from Nuremberg burghers all the way up to the Prince of Sulzbach, and even gone so far as to provide advice to foreigners against the interest of his own city. The great executioner Franz Schmidt, whose many diary entries record (often tersely) the hundreds of hangings, beheadings, drownings, burnings, and breakings on the wheel he performed for Nuremberg over his lifetime, made an unusually voluminous entry for this shocking treachery. And from the sound of it, the duplicitous Master Doctor earned every drop of his executioner’s opprobrium — even if, according to Schmidt’s biographer, the malefactor’s misused position still entitled him to the privilege of execution by the sword, exemption from torture, and a dignified black cloak to wear to his last performance. December 23rd (a Monday). * Master Doctor Nicholas von Gilgen, who was by appointment a privy councillor in an honourable council and was bound to that council by oaths he did not observe; for the sake of money received wrote for and advised two (opposite) parties in many affairs; also gave evidence and sat in council for deliberations and decisions; also stole from my lords of this town the allowances for beer and wine, causing it to be stored by his servants. Also he debauched before her marriage, forcing her to do his will, his servant whom he brought from Trier to this town, and whom he gave as a wife to his clerk Philip Tumbler, by a promise of 50 florins and large presents. According to her declaration she brought forth five children by him, three of which miscarried during delivery or by fright in the twelfth week, two remaining alive, a boy and girl, he being sponsor to the boy at baptism. Similarly, by like promises, he forced his under-maid to consent to his will a year ago, and tried likewise to persuade his brother’s two daughters; one, the wife of Doctor Wurffbaum, he tried to compel, but she resisted, the other the wife of Doctor Calrot, who yielded to his will and consorted with him before and after her marriage, according to her account through fear and compulsion and the promise of many presents and a wedding portion (he did not admit he compelled her, and I do not believe he forced her). Lastly he played false when serving the Prince of Sultzbach, whose advocate he was; he also mediated dishonestly between the families of Nuremberg, and between the noble families of Leschwitz and Redwitz, writing to, and advising both parties in one affair. Likewise he counselled the Italian Charles Albert Nello and other Italians against the rulers of our town; also stole the decrees from the office of an honourable councillor. 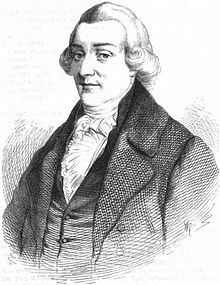 In Italy too, at Padua, he produced a false certificate, when he figured as a doctor there by means of a false certificate, for he became a doctor at Basel only long after. For his evil deeds he lay in prison for thirty-eight weeks in Lugins Land and in the jail. He was led out on Monday by favour in a long mourning cloak, his arms bound behind him with a black silk cord, and led by a cord, a black cloth being spread on the seat (on the scaffold). 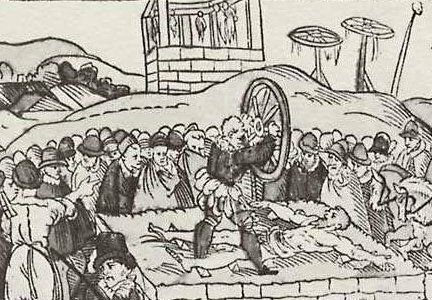 Niklaus von Gulchen’s beheading, from the Nuremberg chronicle. 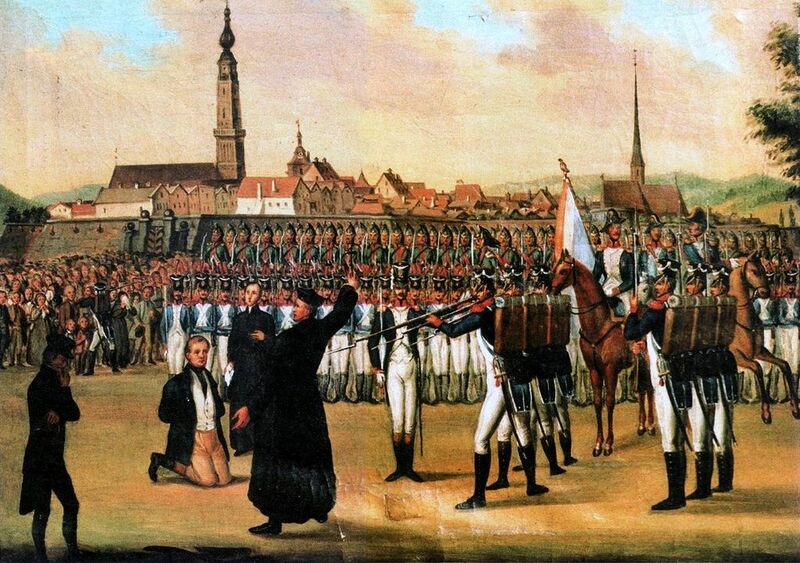 Note that the illustration portrays the doomed pol kneeling, when in fact he was beheaded in a chair. In any stance, von Gulchen “was a mischievious, gold-grubbing man,” according to the chronicler. When he had been beheaded his body was wrapped in the cloth and laid in a wooden coffin, nailed down and taken to St. Peter’s church by the assistant executioner, but removed at night in a cart to St. John’s by the little gate that leads to the Butts, and buried in the graveyard by the walls. * Nuremberg, a Protestant city, was still on the Julian calendar.